Ocean City, New Jersey, U.S.
Preston Stratton Foster (August 24, 1900 – July 14, 1970), was an American actor of stage, film, radio, and television, whose career spanned nearly four decades. He also had a career as a vocalist. Born in Ocean City, New Jersey, in 1900, Foster was the eldest of three children of New Jersey natives Sallie R. (née Stratton) and Walter Foster. Preston had two sisters, Mabel and Anna; and according to federal census records, his family still lived in Ocean City in Cape May County at least as late as 1910. There his father supported the family working as a painter. Sometime between 1910 and 1918, the Fosters relocated to Pitman, New Jersey, where Preston's father was employed as a machinist. The census for 1920 and Preston's earlier draft registration card from 1918 document that he continued to reside at that time at his parents' home at the intersection of Laurel and Snyder avenues in Pitman. Those records document as well that he had a job as a clerk for the New York Ship Company in Camden, New Jersey, located about 17 miles north of Pitman. A decade later, additional census records show that Foster had moved to Queens, New York, where he was living with his first wife, Gertrude, a widow and stage actress who was seven years his senior. The federal census of 1930 also lists Foster as an actor by then, one employed in "Legitimate Vaudeville". Foster began working in films in 1929 after acting on Broadway, where he was still performing as late as November 1931 in the cast of Two Seconds. He soon reprised that stage role in Hollywood in the filmed version of the play. Some of his subsequent films include Doctor X (1932), I Am a Fugitive from a Chain Gang (1932), Annie Oakley (1935), The Last Days of Pompeii (1935), The Informer (1935), Geronimo (1939), My Friend Flicka (1943), and Roger Touhy, Gangster (1944). Foster's career was interrupted by World War II, when he served with the United States Coast Guard. While in active service he rose to the rank of captain, and later he was awarded the honorary rank of commodore. In addition to performing on stage and in numerous films, Foster was an accomplished singer who performed on both radio and in nightclubs, as well as a voice actor on radio. On July 25, 1943, Foster co-starred with Ellen Drew in "China Bridge," a presentation of Silver Theater on CBS radio. Foster also enjoyed a secondary career as a vocalist. In 1948, he created a trio consisting of himself, his second wife Sheila, and guitarist Gene Leis. Leis arranged the songs, and the trio performed on radio and in clubs, appearing with Orrin Tucker, Peggy Ann Garner and Rita Hayworth. In 1950, Foster began performing on the young but rapidly expanding medium of television. His first credited role on the "small screen" was in September of that year on the NBC anthology series Cameo Theatre, in an episode titled "The Westland Case". Later, after a few other appearances on series, he starred in the televised drama Waterfront, playing Captain John Herrick during the 1954-1955 broadcast season. He also guest-starred in 1963 in the ABC drama series Going My Way, starring Gene Kelly. Foster was married twice, the first time to actress Gertrude Elene (Warren) Leonard, a widow who had been born in Woodbury, New Jersey in 1893. The two wed on June 27, 1925, in Manhattan, where they both worked as actors. In the early 1930s, the couple left New York City and relocated to Los Angeles. There, in 1939, they adopted a daughter, Stephanie; but six years later Preston and Gertrude divorced. Foster then married actress Sheila Darcy in 1946, a union that lasted 24 years, until his death. During times between his performances in films and on television, Foster often enjoyed boating and deep-sea fishing, especially for marlin, off California's southern coast. He continued to accept acting offers in his later years, although far less regularly during the final decade of his life. His last film credit was in the role of Nick Kassel in Chubasco, which was released just two years before his death. During his later years, Foster lived in the seaside community of La Jolla, California, part of the city of San Diego. In 1969, when the San Diego Padres made their debut as a Major League Baseball team, Foster wrote a song titled "Let's Go Padres", which was billed as the team's official song. He sang it at some home games that season. Forster died in 1970 at age 69 in La Jolla after what The New York Times described as "a long illness". His gravesite is located at El Camino Memorial Park in San Diego, California. Preston Foster has a star on the Hollywood Walk of Fame at 6801 Hollywood Blvd. ^ a b c d "New York City Marriage Records, 1829-1940". Preston S. Foster and Gertrude Elene [Warren] Leonard, June 27, 1925, Manhattan, New York City, New York, United States. FamilySearch, a free online genealogical database provided as a public service by The Church of Jesus Christ of Latter-day Saints, Salt Lake City, Utah. Retrieved August 16, 2017. ^ a b "The Thirteenth Census of the United States: 1910", enumeration date May 3, 1910, Ward 2 [Ocean City], Cape May County, New Jersey. Bureau of the Census, United States Department of Commerce and Labor, Washington, D.C. Digital copy of original enumeration page available at FamilySearch, a free online genealogical database provided as a public service by The Church of Jesus Christ of Latter-day Saints, Salt Lake City, Utah. In multiple census records the first name of Foster's mother is spelled "Sallie", although on Preston's marriage certificate of 1925, his mother's maiden name is given as "Sally R. Stratton". Retrieved August 17, 2017. ^ a b "The Fourteenth Census of the United States: 1920", enumeration dates January 2–3, 1920, District 1, Pitman Borough, Glouchester County, New Jersey. Bureau of the Census, United States Department of Commerce, Washington, D.C. FamilySearch. Retrieved August 17, 2017. ^ "United States World War I Draft Registration Cards, 1917-1918", "Prest[a]n Stratton Foster" (birthdate 08-24-1900), Gloucester County (no 1), New Jersey, United States, September 12, 1918; National Archives and Record Administration (NARA) microfilm publication M1509. Washington, D.C. Digital image of original registration card available at FamilySearch. Retrieved August 15, 2017. ^ a b The Fifteenth Census of the United States: 1930", enumeration date April 17, 1930, District 1, Queens, New York City, New York. FamilySearch. Retrieved August 15, 2017. ^ a b "Preston Foster", filmography, American Film Institute (AFI), Los Angeles, California. Retrieved August 17, 2017. ^ a b c d "Preston Foster", Internet Movie Database (IMDb), a subsidiary of Amazon, Seattle, Washington. Last retrieved August 16, 2017. 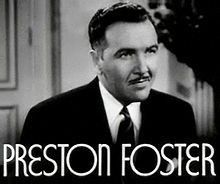 ^ a b c d "Preston Foster Is Dead at 69; Film Star Began Career in 30's", The New York Times, July 15, 1970, p. 39. Retrieved August 16, 2017. ^ a b Habben, David M. (1998). "Preston S. Foster", online memorial 3208 established July 19, 1998, at Find a Grave, a subsidiary of Ancestry.com, Lehi, Utah. Retrieved August 16, 2017. ^ "Ellen Drew, Preston Foster to Star on Silver Theater". Chicago Tribune. July 25, 1943. p. 4W. Retrieved 31 March 2015. ^ "The Westland Case", Cameo Theater, S01E14, originally broadcast September 13, 1950. IMDb. Retrieved August 17, 2017. ^ "New Jersey Births and Christenings, 1660-1980", Gertrude E. Warren, born September 19, 1893, in Woodbury, Glouchester County, New Jersey; transcribed from FHL microfilm 494,226. FamilySearch. Retrieved August 17, 2017. ^ "Thirteenth Census of the United States", enumeration date April 16, 1910, Woodbury City, Glouchester County, New Jersey. FamilySearch. Retrieved August 16, 2017. ^ "The Sixteenth Census of the United States: 1940", enumeration date April 20, 1940, Los Angeles, Los Angeles County, California. FamilySearch. Retrieved August 16, 2017. ^ Chubasco, cast and crew listings and other production details, AFI. Retrieved August 17, 2017. Wikimedia Commons has media related to Preston Foster.